It is hard to believe that the year is over-it has gone by in a blink of the eye. However, during that eye blink, the members and staff of ASNC have done an incredible amount of work to support the appropriate use of nuclear cardiology that helps improve the care of our patients. I am proud to have been given the honor to represent ASNC as president and work alongside the talented and hard-working individuals that make up ASNC. I would like to share with you the many accomplishments we have achieved in 2017 and my hopes for a healthy, prosperous, and peaceful 2018 for all. ASNC continues to be welcomed at forums across the United States where attendees are seeking knowledge and insight to optimize appropriate referrals for cardiovascular imaging to ensure that patients are neither over- or undertreated. At the 50th anniversary conference of the American Academy of Physician Assistants, ACP.17, ASNC launched the Refer Wisely program, hosted an event that drew more than 280 attendees and positioned its booth as a hub for discussion about primary care professionals’ understanding of relevant appropriate use criteria. ASNC continues addressing MACRA and the move toward value-based healthcare on multiple fronts. Society volunteers and staff are in constant communication with government officials, advocating for simple, streamlined policies that will actually serve to improve patient care and outcomes. ASNC is developing a suite of tools to ease the challenges imaging professionals will face as new policies are enacted. The ImageGuide Registry has emerged as an unbeatable tool for meeting MACRA’s Merit-based Incentive Payment System (MIPS) requirements and avoiding reimbursement penalties. Enrollment in ImageGuide – now designated by CMS as a Qualified Clinical Data Registry for the fourth consecutive year – gives facilities access to benchmark data that are invaluable for improving the program quality while fulfilling MIPS reporting obligations. ASNC members are invited to enroll their facilities in ImageGuide Registry at no cost. The complimentary webinar, “Fulfill MIPS Requirements with ImageGuide Registry” explains how it works. ASNC led an advocacy effort composed of multiple physician stakeholder groups calling for indefinite delay of the AUC Program while its value and necessity were evaluated in the context of the Quality Payment Program (QPP). By delaying the program in the Final Rule, CMS is acknowledging that it agrees with commenters that the goals of the QPP are consistent with those of the AUC program. CMS has delayed the effective date of the Appropriate Use Criteria (AUC) Program to Jan. 1, 2020. ASNC has received the highest level of recognition, Accreditation with Commendation, from the Accreditation Council for Continuing Medical Education (ACCME). Accreditation with Commendation is awarded to CME providers that demonstrate compliance in all aspects of accreditation requirements and for demonstrating exemplary engagement with the environment in support of physician learning and quality improvement. ASNC demonstrated compliance with all 22 of ACCME’s accreditation criteria through a system of reporting for each and all of its 35 to 45 CME activities hosted each year, including live programs, enduring materials, journal CME, manuscript CME review and online learning reaching an average of more than 6,000 physicians annually. ASNC thanks its leaders, Education Committee members and Chair Donna Polk, MD, MPH, FASNC, program directors, Journal of Nuclear Cardiology CME editor and editor in chief, and staff for ensuring excellence in the Society’s educational initiatives. The impact factor for ASNC’s esteemed Journal of Nuclear Cardiology climbed to its highest point since it was founded 24 years ago, a full point above its 2015 score. JNC now ranks 17th out of 126 current journals, up from the 27th position, in the Radiology, Nuclear Medicine and Medical Imaging category. JNC also jumped several positions in the Cardiac & Cardiovascular Systems category, from 49th to 38th. There were a number of firsts at ASNC2017. ASNC’s annual meeting was held in Kansas City, Mo. for the first time. Physicians from 58 developing countries were able to access select ASNC2017 sessions as part of a livestreaming initiative supported by the International Atomic Energy Agency (IAEA) and ASNC2017 welcomed several new speakers and the Mayor of Kansas City. MOC points were offered for the attending the live annual meeting and the live Board Prep Course for the first time. Focus for last year’s meeting was disease-based sessions and peer networking. Check out ASNC2017 photos. Save the Date for ASNC2018 in San Francisco, Sept. 6-9! As 2017 drew to a close, ASNC was pleased to announce that a new category III CPT code for Absolute Quantitation of Myocardial Blood Flow in PET would go into effect on Jan. 1, 2018. The new code is 0482T – Absolute quantitation of myocardial blood flow, positron emission tomography, rest and stress. Category III codes are important tools that help to substantiate utilization and clinical efficacy. ASNC led a multi-society advocacy effort to remove prerequisite language for cardiac PET coverage in a local coverage policy. ASNC successfully advocated that the local policy should be aligned with the less onerous national coverage policy. ASNC members have access to a growing database of Practice Points and other resources designed to help medical professionals select the best tests for each patient. 2017 saw the addition of a new downloadable Practice Point that distills key take-aways from ASNC’s 2016 Stress Protocols and Tracers Guideline. The Practice Point offers a clear, concise outline of indications, action mechanisms, procedural guidance, contraindications and test limitations for exercise stress testing as well as pharmacologic stress testing with adenosine, dipyridamole, dobutamine and regadenoson. ASNC and the American Society of Echocardiography (ASE) announced at ASNC2017, a partnership to develop an ASE Echocardiography Module, ImageGuideEcho™. This new module will allow the registry to support both nuclear cardiology and echocardiography laboratories as well interpreting physicians, technologists and sonographers from both fields. ImageGuide’s Qualified Clinical Data Registry (QCDR) designation from the Centers for Medicare and Medicaid Services combined with these new echocardiography performance measures will increase the registry’s value as a tool for meeting Merit-based Incentive Payment System (MIPS) requirements. ASNC and the Institute for the Advancement of Nuclear Cardiology (IANC) are inviting early-career nuclear cardiology investigators to apply for $50,000 in research project funding. The IANC Research Fellowship Award was established in 2017 to encourage and support careers in nuclear cardiology research while growing the science of cardiac imaging and advancing the specialty. The competition is open to most trainees, including post-doctoral fellows and junior faculty who intend to pursue academic careers in nuclear cardiology research. Submit your application for a chance to win funding to support your research, or share this opportunity with your colleagues. Please note: All applications must be received at ASNC headquarters by Jan. 31, 2018. Continuing to be a resource for young professionals in the field, the nuclear cardiology community now has a new career-advancement tool! The ASNC Career Center, launched this past Fall and is a comprehensive resource for job-seekers and employers. Users will find job postings and will be able to add their own resumes, making it easy for employers and nuclear cardiology professionals to forge connections. Organizations seeking quality candidates are invited to post positions-at the ASNC member discounted rate! 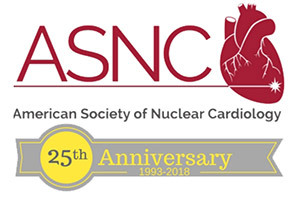 With the arrival of 2018, ASNC marks 25 years of supporting the nuclear cardiology community – its patients, professionals, partners and friends. We’ve launched a year-long celebration of our silver anniversary, so stay tuned for special communications that will highlight past accomplishments, provide access to special resources and opportunities and test your ASNC knowledge!